Puppy Yoga was led by Mind Body Director, Megan Wiley for two 30 minute sessions. 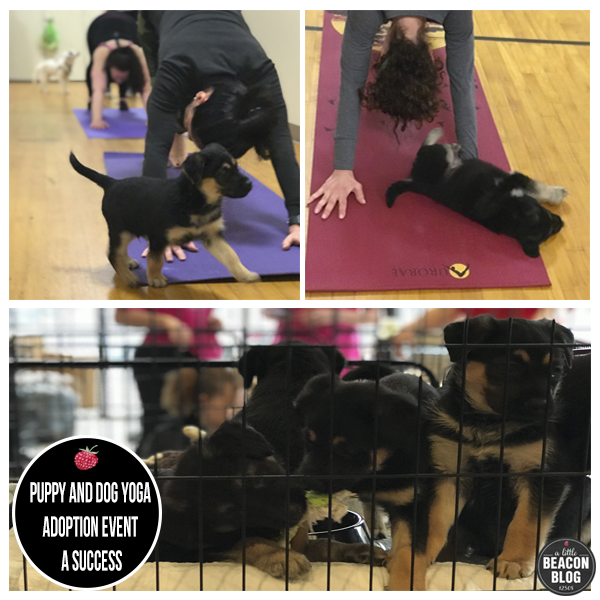 The all-levels yoga class allowed participants to practice their downward dog pose while getting puppy kisses and seeing wagging tails. The puppies get some much-needed socialization, and attendees got a unique way to brighten up their day and exercise routine for the day. In addition to Puppy Yoga, All Sport will continue to have a table in their lobby all month long for collecting pet goods to support the animals at the rescue. Some of the items being collected are Purina Pro-Plan puppy food, puppy and dog toys, WeeWee pads, blankets, and other basic needs for operation. Compassionate Animal Rescue Efforts of Dutchess County (C.A.R.E. of D.C.) is a “No Kill” non-profit pet adoption agency formed in 2016. Founder, Karen LeCain, established C.A.R.E. of D.C. after many years of successful animal rescue and placement. Karen has dedicated her life to ensure that all animals are given a chance at life, whether they’re found sick and afraid, injured, or abandoned. She is takes great care in properly selecting the right applicants for the animals being adopted to ensure the best interests of the pet’s health, well-being, and happiness. 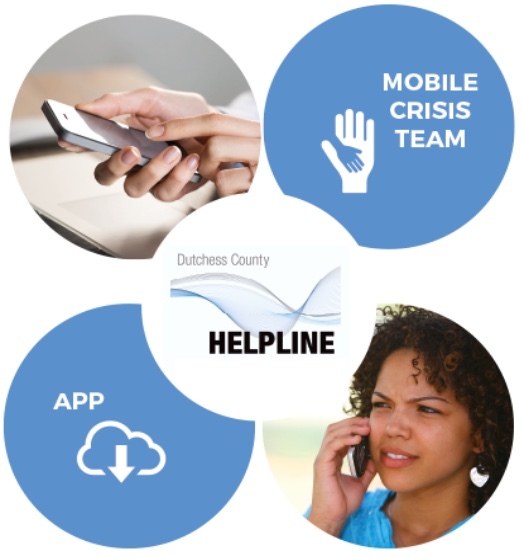 To learn more about CARE of DC, please visit their website at careofdc.org, or call them at 845-240-4862. All Sport Health & Fitness is located in the Village of Fishkill. To learn more, please call (845) 896-5678 or visit www.allsporthealthandfitness.com. Photo Credits: All Sport Health & Fitness. The Howland Cultural Center is celebrating its 40th anniversary, and you are invited to attend and participate. Ticket reservations and sponsorships are available now. The celebration is in honor of Florence Northcutt and the Howland Public Library for their many contributions to the cultural and social life of Beacon. The celebration will take place at the Roundhouse, 2 East Main St., Beacon, N.Y., on Wednesday, May 15, from 5:30 to 8:30 pm. Please call (845) 831-4988 or email information@howlandculturalcenter.org to learn about major sponsorship benefits. The Highlands Current is a local newspaper you’ve seen around town, stacked in storefronts, and now in the blue boxes that keep popping up on street corners. The paper is a nonprofit organization, and while they do rely on advertising, they count on individual donations more - 75% of publishing costs come from donors! The paper, which is distributed for FREE, is in the final, heated days of their big fundraising appeal, and needs Beacon’s help! 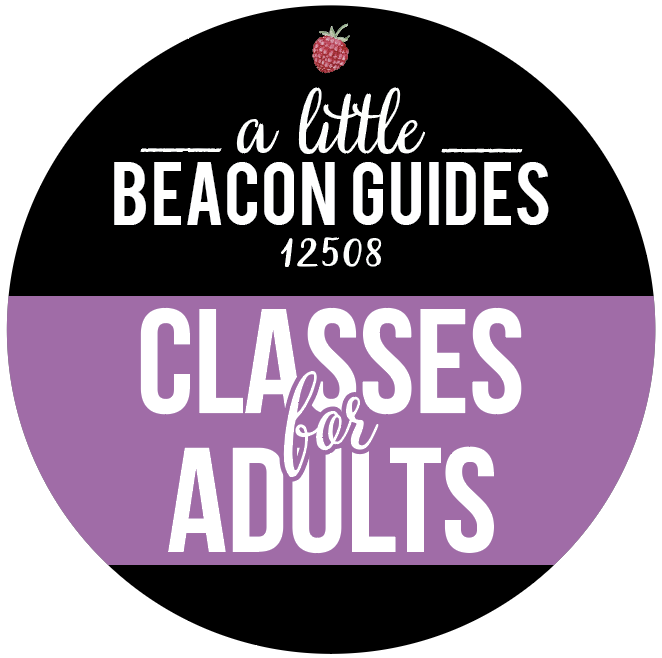 Beaconites are so important to the publication, that the paper has invested in an ad campaign here at A Little Beacon Blog to help them get the word out. And you know we love helping to spread the good word. Years ago, the Highlands Current was launched and covered Cold Spring, Garrison, Nelsonville and North Highlands. In 2015, they expanded their coverage to include Beacon by dedicating at least two reporters, Jeff Simms and Brian PJ Cronin, to cover the Beacon “beat” (newspaper term), as well as Alison Rooney to feature stories on the arts, Michael Turton with some articles (he also delivers the papers all around town) and Pamela Doan, the editor of the Calendar section that includes Beacon events in their roundup. And now I too have joined the ranks as a columnist with my “Kid Friendly” column over there. If you attend City Council or Board of Education meetings, you stand a good chance of seeing Jeff or Brian in the unofficial “press box” (aka somewhere in the front rows). Thanks to this dedication, The Highlands Current is often the first to report on big changes coming out of our City Council - changes that impact your daily life here in Beacon. Also because of this investment, their reporters follow different events each week at these meetings, so are super familiar with the twists and turns the issues make, and often weave these significant details into their articles for better context. Because they print on paper, a newspaper doesn’t get to use as much space as a blog does, so often they have to select their words so carefully, and cram hours’ worth of events and pages of supporting documents into three tiny paragraphs! The paper published this picture to show how two Beacon Reporters work from the Telephone Building through Beahive’s shared office space. Little known fact to bolster your Beacon trivia base: The Highlands Current stations their reporters out of the Telephone Building in Beahive’s shared work space. A Little Beacon Blog also has our office in the Telephone Building! It’s fun to be in a communications hub like this. Fundraising Opportunity - Double Match Going On Now ’Til December 31! Thanks to a grant from NewsMatch and an anonymous donor, any contribution from $1 to $1,000 will be matched two times until December 31! Even if you gave just $10, it matters! Yes, the dollars help, but new donors are equally important. New donors signal to the newspaper that you care, and you want their coverage to continue. 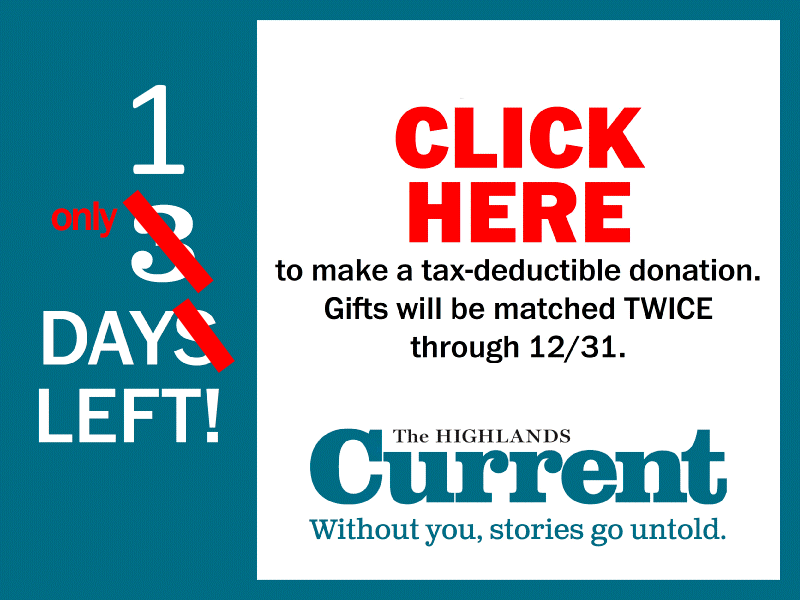 If you have already donated to the Highlands Current this year, consider asking your spouse or best friend to also donate if they haven’t yet. #NewDonorAlert! PS: If you are reading this article after December 31, 2018, you can still donate! Every little bit helps. Christmas trees for sale in the Beacon Engine parking lot. 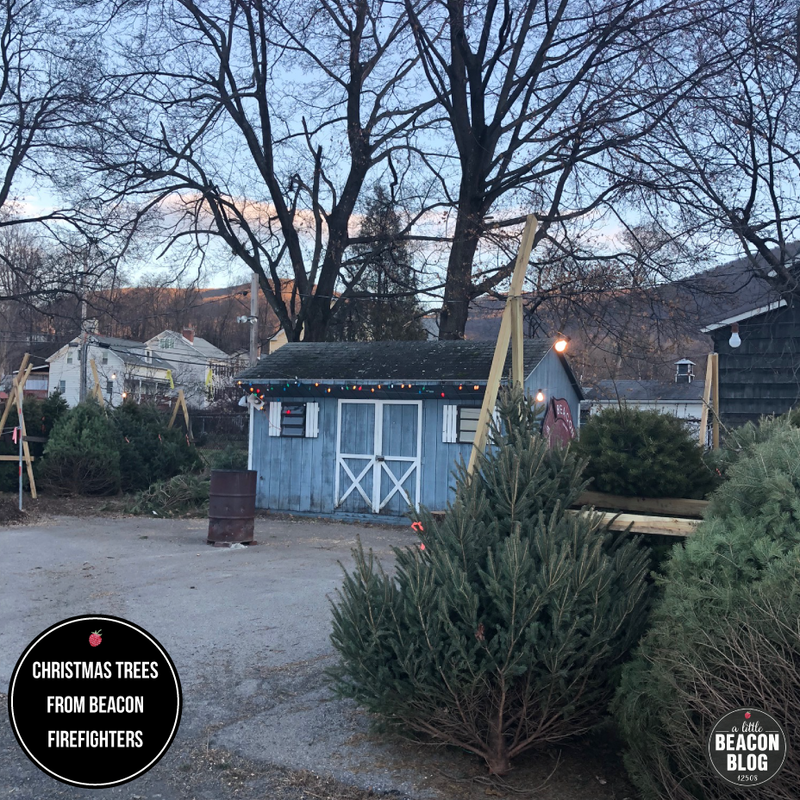 In case you wanted more warm and fuzzy feelings about where you are getting your Christmas Tree this year, the Beacon Engine Fire Company has gotten their X-MAS TREES sign back out, and filled the lot with plump trees - all just waiting to be strapped to the top of your car. The Christmas trees are sold from the Beacon Engine parking lot at 60 East Main Street, right next to Dogwood’s parking lot. A single rope divides the lots. Open hours are Wednesday to Friday, 5 to 9 pm, and Saturday and Sunday, 10 am to 6 pm. Speaking of, you can make an easy night of it with dinner at any of the restaurants on the east side of Beacon, like Dogwood, Melzingah Tap House, or Sukhothai. 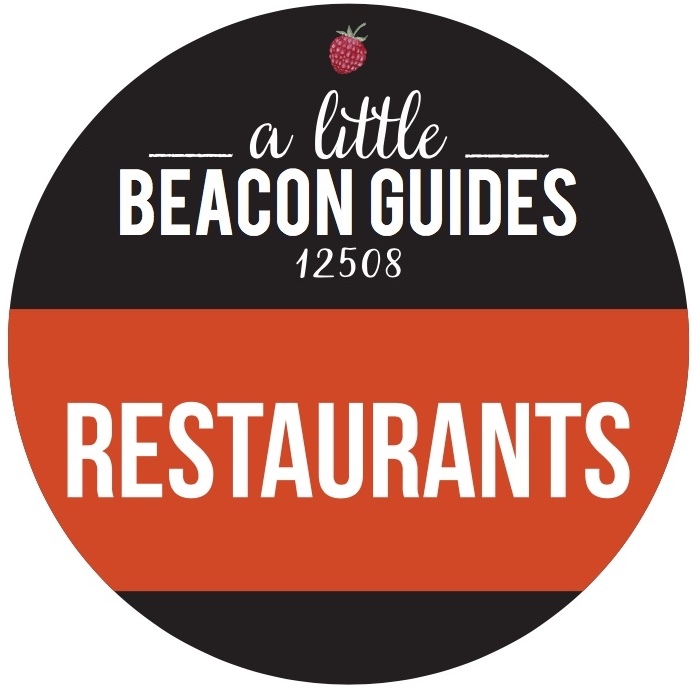 See A Little Beacon Blog’s Restaurant Guide for more dinner ideas. Share your pics of which tree you take home! 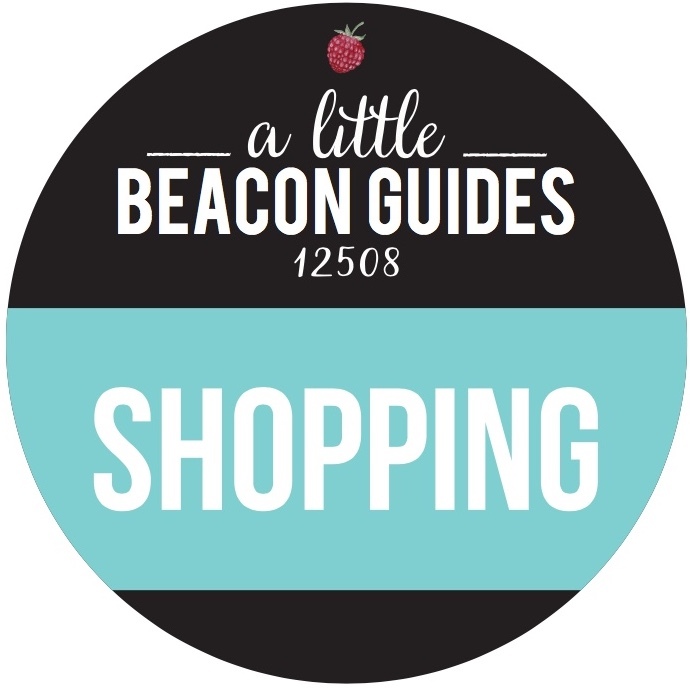 Tag A Little Beacon Blog in your Instagram photo - we’re @alittlebeacon. P.S. : While we’re mentioning the Engine Co., we should share an important public-service announcement: The City of Beacon Fire Department reminds you to not leave cell phone chargers plugged in! They are a fire hazard. Pictured here is the 2018 toy collection at Beacon Pilates. Every year, community organizations fire up toy drives to help donate to kids in need. If you’re looking to donate toys to these drives, it’s best to mark your calendar for just before Thanksgiving, as that’s when these opportunities start opening up - some are even as early as October, like Toys for Tots. It’s good to get an early start too with Adopt-a-Family programs, which require more attention to detail in terms of what kind of toys you are purchasing for which family member. So mark your calendar for mid-November to return to this list to get a head start! And subscribe to our newsletter to get early advance notice. If you missed a toy deadline and really want to give, consider a donation to the organization the toy is being collected for instead. Wish Lists: Generally, the organization provides guidance on what type of gift to give. They know their kids and what they need or want. New: Toys need to be new and in original packaging. Usually Unwrapped: Usually the Wish List will ask for unwrapped toys. No Guns or Other Violent Toys: Even if your kids love it, there is extra sensitivity for these kids. Beacon Pilates is collecting new toys for Children’s Home of Poughkeepsie. Wish List: Click here for the wish list and gift guidance. Juliet, the owner of Beacon Pilates, also has a list of individual wish list items. Email info@beaconpilates.com for more specific recommendations. The Children’s Home is dedicated to providing a safe and nurturing environment that improves lives and empowers at-risk children and families in the Hudson Valley and surrounding communities. The Children’s Home of Poughkeepsie provides residential care on the main campus in Poughkeepsie, in agency boarding homes or group homes off campus and apartments in the community. On any given day, over 90 children receive services in one of the home’s programs. The Studio @ Beacon is collecting new toys for Toys For Tots. The basic mission of the Marine Toys for Tots Program is to collect new, unwrapped toys and distribute those toys to less fortunate children at Christmas. The primary goal of Marine Toys for Tots is, through the gift of a new toy, help bring the joy of Christmas and send a message of hope to America's less fortunate children. In order to better execute the program, in 1991 the Marine Toys for Tots Foundation was created at the behest of the Marine Corps. The Salvation Army of Beacon is collecting toys via their “Angel Tree” at two locations with Wish Tags. Says Captain Leilani Alarcon: “We have toy wishes, and usually also like to get a couple of warm outfits, since most of the kids that participate are needy and their parents can’t afford to buy coats and boots, and such. Everything desired is on the tag. Wherever the tag is picked up, is a drop-off location, or people can bring them directly to our location in Beacon - the church. My email and cell information are on the tags for people to arrange drop-offs at our building. Wish List: Select a tag from the Angel Tree. It will have an exact idea. Salvation Army Church in Beacon: 372 Main St., Beacon NY (drop-off only, the Angel Trees are at the above locations). The main entrance of the church is actually behind it, by their parking lot off of Fishkill Avenue. Tuesdays and Thursdays are best for dropping off toys or bringing a donation to their Food Pantry (even year-round), as that is when their receptionist is there. Or, you can email Captain Leilani Alarcon at Leilani.Alarcon@USE.SalvationArmy.Org to make arrangements for other days. Libby Funeral Home is collecting stuffed stockings for Stockings For Soldiers. If filling stockings brings you joy during the holiday season, and so does giving the stockings to someone who isn’t expecting them, then this holiday initiative is for you. Libby Funeral Home has set up a free stocking for you to take home, decorate and stuff to the brim with holiday cheer. You will receive a list of recommended items along with the stocking. Libby Funeral & Cremation Services will ship the stockings (at their expense) to troops abroad in time for the holidays. Grace Smith House organizes an annual Adopt-A-Family program. During the holiday season, Grace Smith House opens its doors to countless survivors of domestic violence and their families. They need your help to provide holiday joy to the families shelter serve. Consider adopting a family for this holiday season. You can be matched with a family and their recommended gift list, and the matching process is going on now. See here for more information on how to apply. All Sport Health + Fitness is collecting select gifts via a wish-list tree. To participate, go to the fitness center and take a wish off the tree. Fulfill the wish, and bring it back! The fifth annual Toy Giveaway in Honor of Carmen Viruet-Senato is being hosted with the help of Love Holds Life Children’s Cancer Foundation. They are collecting new and unwrapped toys for children ages 2 to 14 years old, to be distributed on Saturday, December 15, with Cookies and Cocoa with Santa at Lewis Tompkins Hose Co. #1. According to Southern Dutchess News, the event is in honor of Carmen Viruet-Senato, co-founder of LHL. The event is in memory of Leticia Dos Santos. Richard Senato, founder of LHL, said Leticia was 16 years old when she passed from Stage 4 bone cancer. She created the Cookies and Cocoa event with Senato and Viruet-Senato five years ago. Deadline: Donation deadline is Friday, December 7. Event for any child to receive a free toy is Saturday, December 15 from 10 am to 1 pm. All are invited. 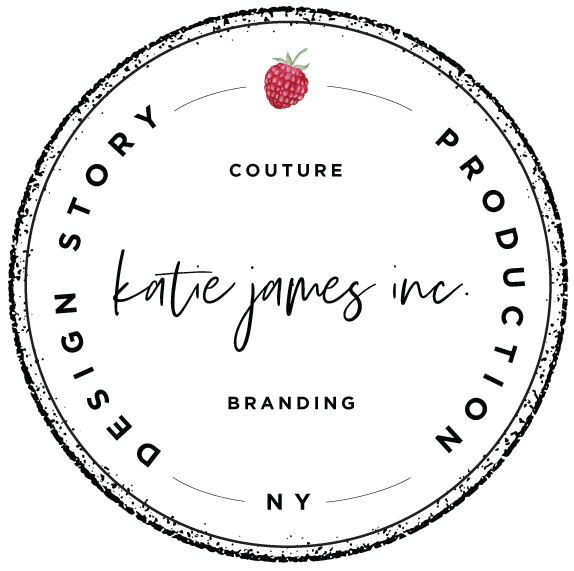 Love Holds Life helps children and their families financially battling cancer, on a national level from their offices located in New York's Hudson Valley region. Love Holds Life provides financial support for their medical treatments and expenses not covered by insurance. LHL’s ultimate mission is to ensure children with love and life. Their financial program consists of funding a child’s medical deductible, co-payment, co-insurance and prescriptions, along with travel reimbursement to and from treatment. Donations received from individuals, foundations, corporations and other local organizations help to fund each child and their family. As we hear of more Toy Drive Collections, we will update this list. Keep refreshing the page! If you are running a toy drive, please email details in the format matching the above listings to editorial@alittlebeaconblog.com. Thanks! In March 2018, A Little Beacon Blog was the proud sponsor of the Move It Baby, Move It family dance party and fundraiser for the newly formed Newburgh LGBTQ+ Center. We checked in with the fundraiser's organizer and author of this article, Phoebe Zinman Winters, to see how it all went! This dance party fundraiser for the Newburgh LGBTQ+ Center tore up Quinn’s dance floor with some superstar DJs, raffle prizes and dancers that didn’t quit. Those dancing families raised $1,000 for the Newburgh LGBTQ+ Center, which helped the center open new doors. Photo Credit: Phoebe Zinman Winters. The DJs are Decora and H2O. We are so pleased to share such a great update from them! Karen Naimool from The Newburgh LBGTQ+ Center reports that they used the funds to rent space in Newburgh for a "pop-up office." "We are able to go into this venture for three months and are looking for additional funding to help us keep the doors open,” said Karen. The office will be used for general operations as well as a place where resources and events can be offered. 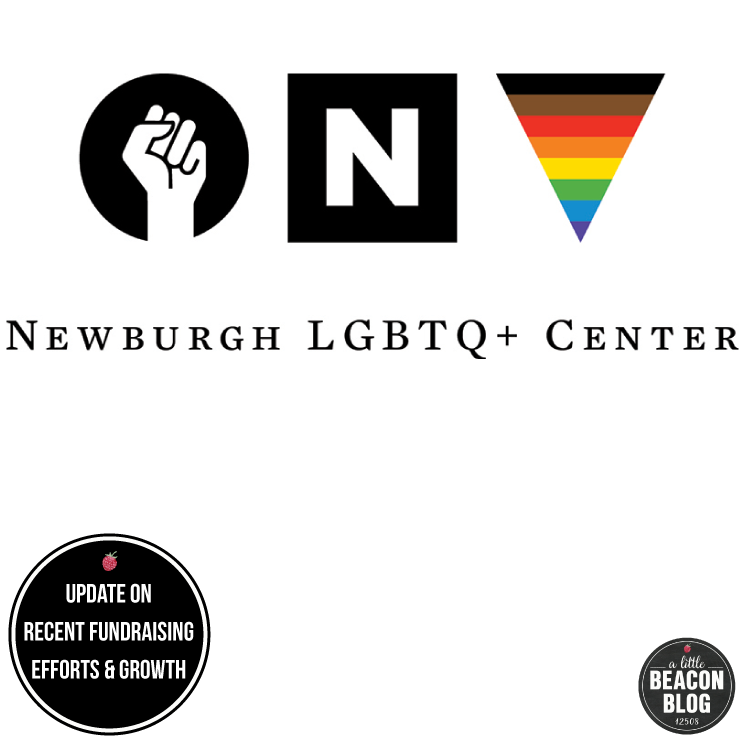 The Newburgh LBGTQ+ Center is involved in many events, education and trainings for community and board members; they also work on increasing their visibility in the community. The Newburgh LBGTQ+ Center's Purple Rain Prince Tribute Dance Party and Drag Show Fundraiser was in June, and fundraising dancers laced up our dancing shoes again (or zipped up our dancing boots) and partied like it was 1999. It was an especially good time and the dance floor was overflowing with cuteness and love. The next dance party is a drag show happening during Newburgh's Last Saturday celebrations on August 25, from 10 pm to 2 am at The Wherehouse on Liberty Street in Newburgh. The Newburgh LGBTQ+ Center set a fundraising goal in June 2018, and made it to $3,760.77! This funding will go towards programs (materials, advertising, etc…), stipends for organizers and further leadership development through trainings, retreats and workshops. If you’d like to contribute to the center's current fundraising goals, you can donate at https://www.gofundme.com/5mprazs to continue to grow and support this valuable local resource in its mission to serve the needs of the community. Stay tuned for more fabulous Move It Baby, Move It dance parties in the future, and if you have any great ideas for fundraising recipients, you can send them along to phoebe@alittlebeaconblog.com. This year, enjoy a new flavor at the Beacon Sloop Club's Corn Festival, down at the Pete and Toshi Seeger Park (Riverfront Park) in Beacon, NY, on Sunday, August 12, 2018 from noon to 5 pm. The event is rain or shine, so pack a poncho just in case! 1. Anyone can enter. The only rule is that the corn bread must be made from scratch. 2. Prize for first place is $25. 3. To enter, bring your corn bread to the Contest Tent before 2 pm. Bring your corn bread on a dish or plate, along with a card with your name, phone number, and recipe. Besides the name of your recipe, please include the ingredients used. Attach the card to the plate. If you would like your plate returned, please note that on the card. 4. The judging will start about 2:15 pm and consider such aspects as taste, appearance, and texture. 5. Winners will be announced from the tent at 3 pm. Fresh picked, ready‐to‐eat, local‐grown sweet corn on the cob is the feature of this festival down at Riverfront Park, now known as the Pete and Toshi Seeger Park for their decades of work to improve and protect the Hudson River. Enjoy cold drinks and other summer treats. Environmental displays will be set up, and fun activities for all ages will be available. The sloop Woody Guthrie will give free public sails (weather permitting), and there will be lots of craft and food vendors. Two solar music stages will feature great sounds. Free admission. Those interested in vending can email rmthomas99@yahoo.com or call (845) 463-4660. For more information, check out the Beacon Sloop Club's website - www.beaconsloopclub.org. Don't let the name fool you! The organizers of this event - The Beacon Recreation Department - are inspired by all sorts of things. This second annual epic trail run through the University Settlement Park is named after a road race movie (Cannonball Run) starring Burt Reynolds, Roger Moore, and Farrah Fawcett. In this case, though, the run is with your legs - you're jogging, walking or sprinting the 5K or 1-mile trail - and the cannonball is going to be YOU jumping into the pool after you finish the race! That's right - the Beacon Pool is part of the course! Bonus points for the raffle prize you might win from Meyer's Olde Dutch (burgers and such), Mountain Tops Outfitters, Garrison Art Center, Fishkill Farms, or one of the many more local business sponsors who have stepped up to aid in the run's fundraising efforts. You don't even have to be a runner/walker to enter the raffle! A Little Beacon Blog is a proud media sponsor of Beacon's Cannonball Run because we are hooked on its mission. 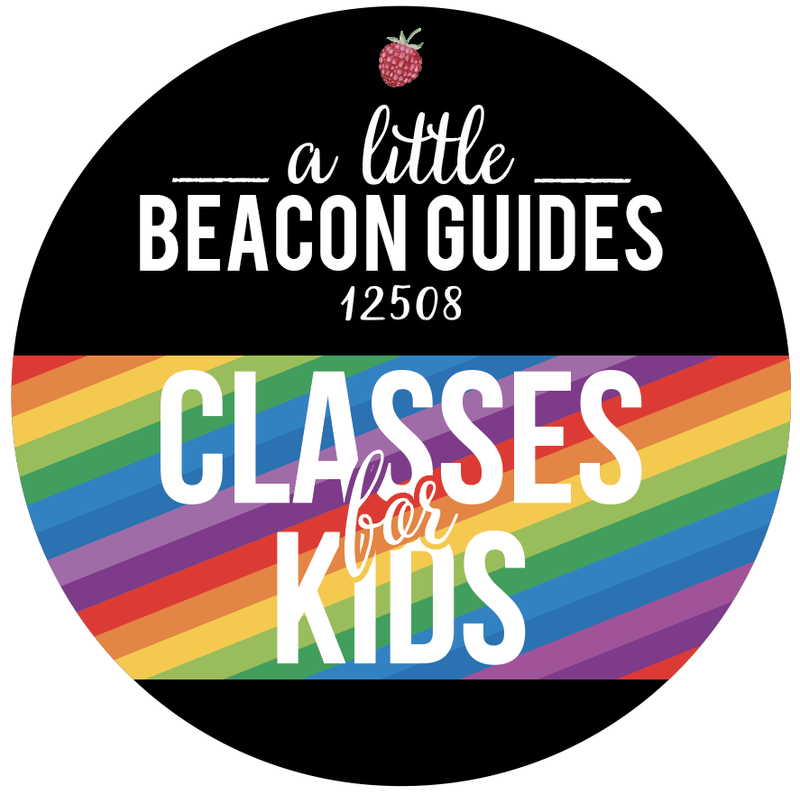 The proceeds from the race registrations and raffle tickets go to the Beacon After School Program, which started in Beacon's elementary schools. But if enough money is raised, and another mile marker is hit, then monies will be used toward starting the After School Program in the Middle School. This has been a tremendous program benefiting kids and working parents, and parents who simply want more options for their kids after school. Read our article to learn more about the program and the race, and see you bright and early tomorrow (Saturday) morning! 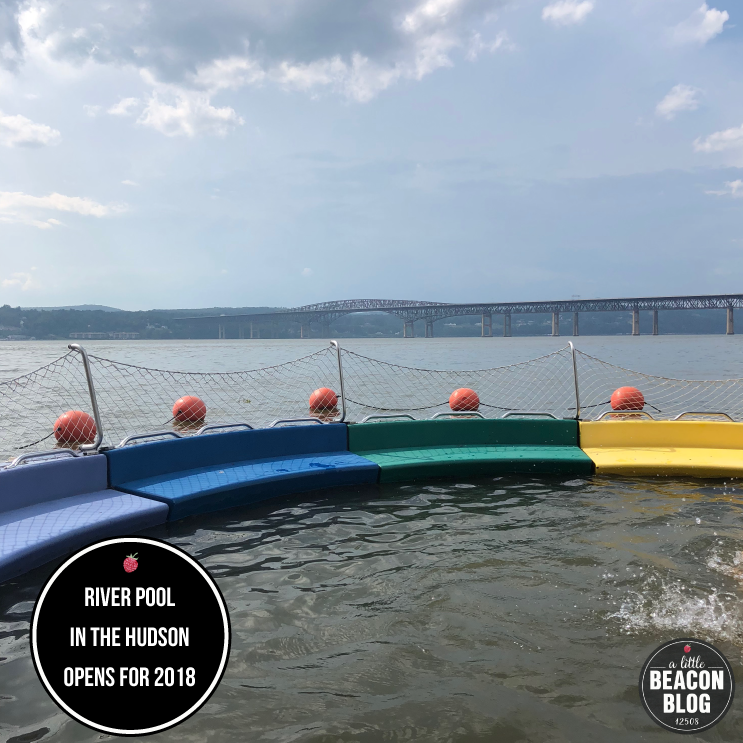 The River Pool at Beacon IN The Hudson River Opens for 2018! The left side of The Beacon River Pool - eye level. As you play at Riverfront Park, known since 2014 as Pete and Toshi Seeger Riverfront Park, you may have experienced the extreme desire to swim in the Hudson River to cool off. Well, now you can - because The River Pool at Beacon is open again this year! Starting in 2007, five years after submitting construction plans to New York State, the pool opened to the public for the first time. The river pool idea was originally proposed by the pool's co-founder, Pete Seeger, according to the pool's History page. The river pool is netted and shallow, with a net bottom designed by Meta Brunzema Architect P.C., a New York City-based design firm. You could crawl on it, with a child on your back, pretending you are an alligator gliding just under the water surface. Or you could sit or stand in the shallow water, enjoying the breeze off the water and gazing up or down the river, thankful you aren't in the traffic moving (or not moving) on the Newburgh/Beacon Bridge. Or, you could simply sit on the colorful plastic seats and bask in the sun, slipping further into the water as you're ready. River pools aren't unique to this spot - they have been around since at least 1830, up and down the Hudson River - but they were removed after 1930 due to water pollution. Pete Seeger was a major advocate for cleanup of the Hudson River. Thanks to his efforts as well as many other organizations including Scenic Hudson and Riverkeeper, the river has improved since then, and many groups and people continue to advocate in this direction. Can Anyone Use the River Pool? It's a free pool for all, thanks to support from individual donations, New York State Department of Environmental Conservation, the Durst Organization, the Abrons Foundation, the Hudson River Foundation. The pool's organizers actually want to increase its size. They're working with another architecture firm to design a bigger pool, and they're talking with cities and towns to find the right location that offers agreeable environmental considerations. What's It Like Swimming in the River Pool? The changing room at The Beacon River Pool. So fun. So relaxing. You're IN the river, just sitting there protected from the currents by the anchored netting. The pool is small, so you'll be near others as they dip in and out of the pool. The pool is also very shallow: An adult is up to their waist or thighs. The River Pool is fully staffed by lifeguards, and even has a changing room! If thunder rolls in and you need to leave the pool and wait 30 thunder-free minutes to go back in, you could always shoot baskets at the park's basketball court, or play on the playgrounds. Or have a picnic on the grass (watch out for alllll of the goose poop). An additional perk: Riverfront Park is very breezy, so you'll be cooled off quickly down by the river no matter what. Is Swimming in the Hudson River Safe? The Hudson River was contaminated by companies who dumped pollutants into it for many years. An ongoing effort to clean up the Hudson River has spanned several decades. As of today, it has reached cleaner levels, but is closely monitored by The River Pool at Beacon. Says a representative from The River Pool this year: "The quality in Beacon Harbor is definitely of concern. Beacon Harbor had a long run of low numbers. We hope this is a temporary situation. That said, the pool is off the north shore of Pete and Toshi Seeger Riverfront Park. The water is tested every week by the county health department. We would not open if the water was not considered safe for swimming." Swim For The Pool - From Beacon To Newburgh! Fundraising continues for the pool with regular donations that you can make at any time, and during the 15th Annual Newburgh to Beacon Hudson River Swim, where you can sponsor a swimmer - or be a swimmer that people sponsor! See the Beacon to Newburgh Swim page for details. Make a donation here to keep this all going, but don't worry if you can't. It was designed for all to be able to access and experience the Hudson River. See you at the pool! The Race That Runs The Trails, and Ends IN The Pool! 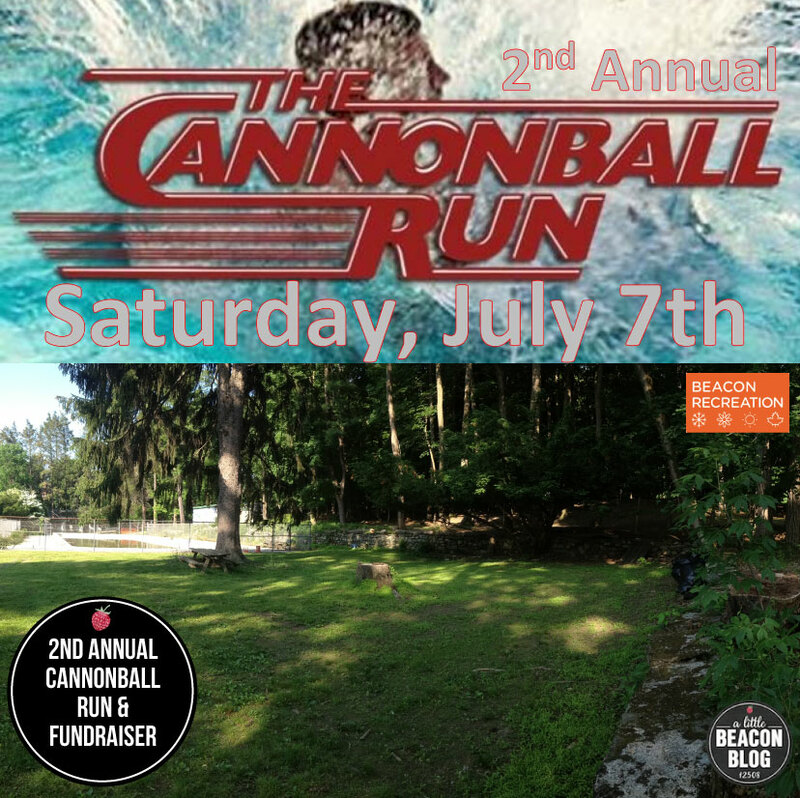 The Beacon Recreation Department is producing their 2nd Annual Cannonball Run, a 5K and 1-mile race through the trails of the University Settlement Camp, located on Wolcott Avenue on your way out of town toward Cold Spring on Saturday, July 7, 2018. This is a race with an extra splash of fun - you get to start at the Beacon Pool, and end with a jump into the pool. Says Nate Smith, assistant director of the Beacon Recreation Department: "You can walk, stroll, jog, sprint, however you want to participate. We just want you to have fun. Though this is a trail run, so there will be some hills. Just to make it more exciting." If you don't feel like running, you can still enjoy the event by taking part in a huge raffle. On offer: plenty of prizes from your favorite local businesses, including the Beacon Creamery, Trax Espresso Bar, Meyer's Olde Dutch Food & Such, Artisan Wine Shop, and many others. Bagels are being donated by Beacon Bagel for early registrants, and Sal's Pizza is pitching in a few pizza pies for after the race. The South Avenue PTO Collaborative will be selling ice pops and water. So bring your bathing suit, and be ready for a great Saturday morning. The run itself is awesome, but the main reason for the event is to raise funds for Beacon's After School Programs, which have been instrumental in hugely improving the public school experience in Beacon. See our article here from when the program first launched in the elementary schools. If enough money is raised during this event, funding will go toward a new middle-school After School Program - it's the trickle-up effect! Fundraising efforts will help the Beacon Recreation Department secure the funds they need to start that program. The five-day program, which runs from 3 to 6 pm on school days, started in the elementary schools, allowing enrolled kids to stay at school and engage in different themed activities each day, such as Yoga, Martial Arts, Spanish, and more. Local businesspeople are involved and serve as the instructors. "It has been a win-win for everyone," says Nate. A Little Beacon Blog is a proud media sponsor of this Cannonball Run, as we have first-hand experience of how wonderful the After School Program is - including instructors, caregivers and programming. We give this event a double-high five! Participants have the choice of doing a 5K (just over 3 miles) or a 1-mile trail run. The race begins at the pool and ends IN the pool. Registration begins at 9:30 am and the suggested donation is $20 for the 5K, $5 for the 1-mile. You can also pre-register at the City of Beacon Recreation Department's Facebook Page. Win Some Of The Best Prizes Around! Time: Music starts at 5 pm. Fireworks begin at 9 pm. Entertainment: There will be live music, and vendors selling food. "When are Beacon's fireworks this year?" It's a simple question. One that normally has an answer without a second thought. When annual events or things happen - like hanging baskets of petunias on Main Street - one doesn't normally question how or why they happen, only that they do happen. So when chatter started about Beacon's fireworks not happening for 2018, ears perked up in disbelief. Rather than accept that Beacon wouldn't have fireworks, Beaconites took it upon themselves to make it happen. The Spirit of Beacon Day Parade almost didn't happen in 2018 when its organizers disbanded (but then it did happen, as new organizers stepped in!). The Memorial Day Parade, which is organized by veterans who live in Beacon, did not happen in 2018, but will return in 2019, as announced by a veteran during last month's Memorial Day service at the Memorial Building. They expressed how humbled they were by the public's strong turnout to this year's ceremony. Another group of Beacon citizens has organized a reading of the Declaration of Independence set to happen on Wednesday, July 4, at 11 am. You may not have realized that historically, the Kiwanis Club of Beacon did the fundraising for the fireworks. 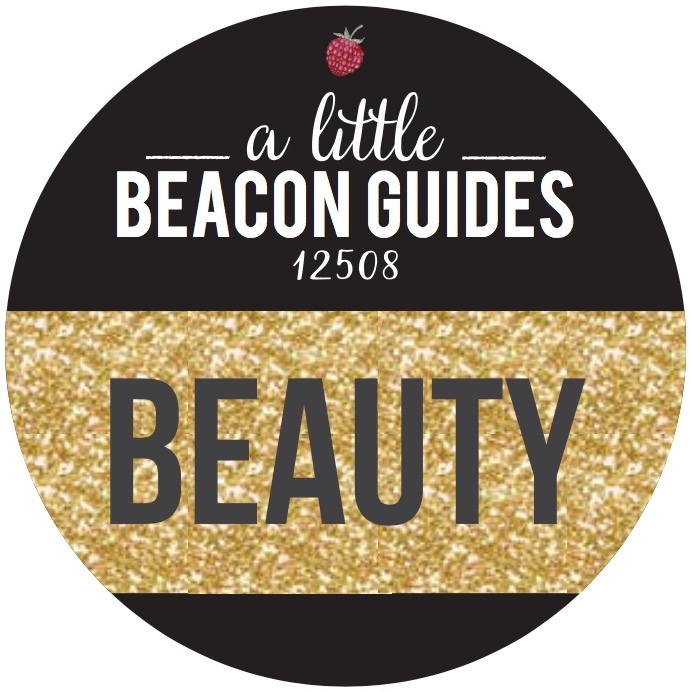 Additionally, the organization known as "I Am Beacon" used to play a part in organizing events that began in the afternoon and ran into the night. Sometimes things change, however, and unfortunately, the Kiwanis Club disbanded this year with no clear guideline in place for passing the firework fundraising torch (irresistible pun intended). Enter LT Sherpa, owner of Beacon Natural Market. He was overcome with shock when he heard that there would be no fireworks in Beacon. "You can't have the Fourth of July without fireworks," he said to himself, and then to me while interviewing him for this story. "I decided that the Beacon Natural Market would offer to sponsor the fireworks," LT continued. "After speaking to the mayor and discovering that the cost was a little more than what the market could do alone, I spearheaded a donation drive from Beacon businesses to hold the fireworks. Beacon has been good to businesses, and I want us to give back.” LT is working with Mark Price, director of Beacon's Recreation Department, who has usually facilitated the production of Beacon's Fourth of July celebration in years past. 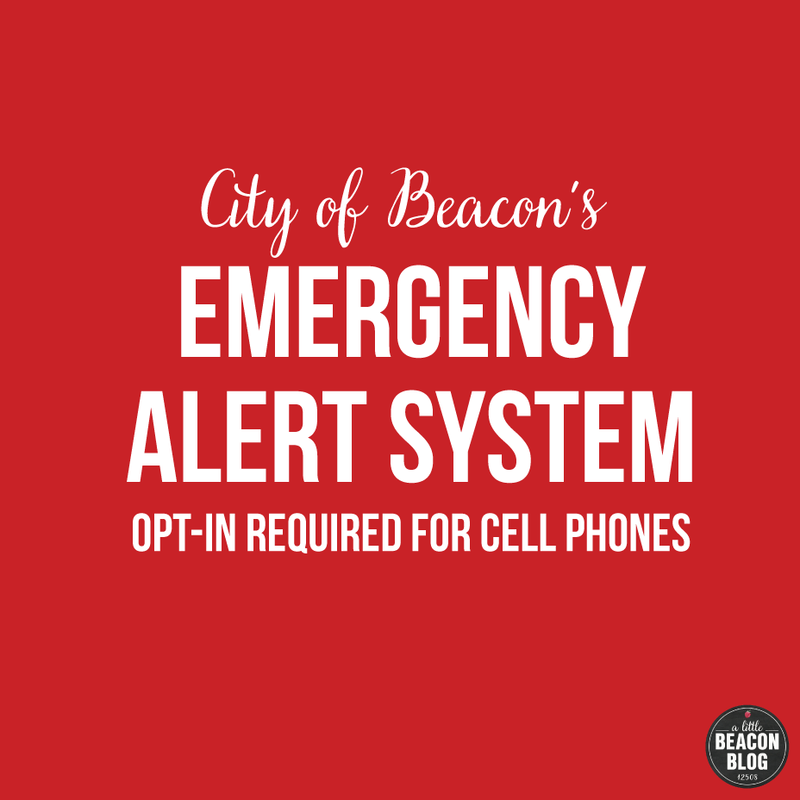 Checks: Make payable to the City of Beacon. No matter what LT and his wife Kitty raise during the donation drive, LT has assured the City that he is writing a check for the full amount of the fireworks. The fireworks will commence on Sunday, July 1, 2018, and there is no rain date. All donations for the fireworks can be made out to the City of Beacon, and can be dropped off at Beacon Natural Market. Some of you know Manny from Verplanck Auto, and some of you have your cars in his lot right now being repaired. Said Manny when being interviewed for this story: "I spoke to Mark Price on a chance meeting about this event. I wanted to help. My son, who will be a high school senior this year, Zack Taylor, has been performing at the Fourth of July celebration for the past three to four years with his band, Seal the Deal." Manny and LT are working with Mark from the Recreation Department, who is orchestrating the programming for the entire day. "People are coming out of the woodwork to help out," said Manny. "L+J is donating the sound equipment, and many others are donating time and such to the whole process," said Manny. The festival will be at Memorial Park on Sunday, July 1. There will be vendors selling food as well as live music. The music starts at 5 pm, and will be done by the time the fireworks begin at 9 pm. If you are involved with this year's production or if you have already donated, go ahead and give yourself a shout-out and pat on the back in the Comments below! M&T Bank, John Car Realty, Homespun, Dominic Penzetta, Dogwood, Drink More Good, Hudson, Valley Auctioneers, Greg Zabel, Hudson Beach Glass, Artisan Wine Store, Hudson Valley Brewery, Mobile Gas Station, Quinns, Quinns Employees, Keyfood, Antalek & Moore, Mountain Tops, Kitchen Sink, Hudson Valley Zoned, Luxe Optical, Law Office of Dennis Vetrano, Gate House Realty, Kiwanis Club, Roundhouse, Melzingah Tap House, Poppy’s, Beacon Natural Market, and Thundercut. *All proceeds benefit Robin Testerman, to help pay mounting medical bills for cancer treatment. Song and dance will take the stage at Beacon High School as the extended performing arts community—including John Jay Proscenium Alumni, The Beacon Players, Spackenkill High School’s Spack Onstage, and Beacon Performing Arts Center—pool their talents to benefit local champion of theater Robin Testerman. With the goal of offsetting Robin’s mounting medical bills due to cancer treatment, the area’s best and brightest present an evening of Broadway hits, including selections from Rodgers & Hammerstein’s Cinderella, Footloose, West Side Story, Les Miserables, A Chorus Line, Aida, Jekyll & Hyde, The Little Mermaid, Phantom of the Opera, and so much more. Special guest Ryan Dutcher, a nationally known illusionist, will provide fast-paced magical entertainment, cutting-edge comedy, and opportunities for audience participation in his mesmerizing act. Before the show and during intermission, enjoy light refreshments while you browse the silent auction, offering tantalizing experiences and wares. More special appearances may be happening (perhaps a Broadway star or two?) at this can’t-miss musical event of the year.